This little device is really mighty, and provides an amazing viewing experience. Just imagine watching movies on a huge, 120-inch screen in your own backyard. You are able to connect it to your mobile device, and project anything you desire, onto a ceiling, wall, and even a tent, in HD. Since it boasts a rechargeable battery, and is only a two-inch square, you can even bring the Cube with you camping. 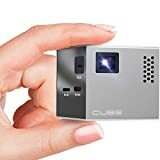 This is a pico projector which comes with Micro SD card reader, its own internal speaker, and HDMI input allowing you to connect the Cube to your devices such as your laptop, smartphone, desktop, and more. Is the RIF6 Cube Pico DLP Mini Projector Worth Your Money? If you are considering buying a mini projector with loads of great features, than this one should probably be one of the top choices. Here’s why. The picture on this model provides great color output as well as great clarity. It is capable of producing 120-inch screen image, and you will find RIF6 Cube Pico DLP Mini projector surprisingly bright. The image it produces is strong enough to utilize in rooms with low amount of light. Furthermore, this device is truly portable, and has built-in battery that can supply 90 minutes of power. It also boasts a power port that allows you to plug the Cube into the wall. This mini projector has a headphone jack and internal speakers, but also features an audio port as well, allowing you to connect it to an external source in order to customize the audio. Moreover, this mini projector’s powerful LED light source is really long lasting, since it provides 20,000 hours of life. Just imagine what this means-you’ll be able to give 20,000 presentations (one-hour long), or watch more than 10,000 movies on this little device before you need a replacement. There are many cool things that you can do with this projector. For instance, if you like to read, this little guy can provide you with unique reading experience. You can connect one of your devices (like Kindle, if you own one), and enjoy reading your favorite books on a 120-inch screen. This little projector’s connectivity to other devices such as laptops, smartphones, or desktops is great. The ability of connecting their projector to mobile devices, or streaming movie content from a desktop or laptop is really important to majority of customers. 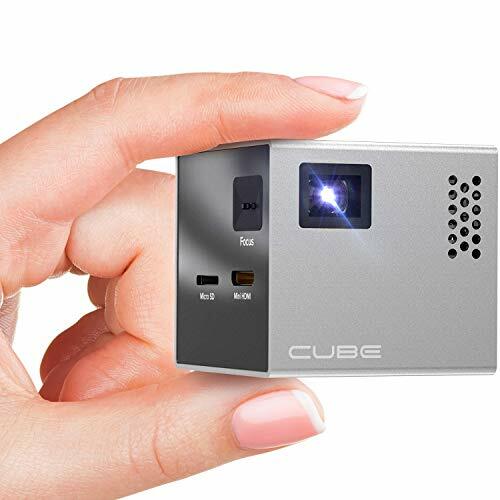 Many will surely be pleased to know that the RIF6 Cube Pico DLP Mini projector has the ability of connecting to a vast range of different devices: PC, MAC, Samsung, iPhone, iOS, gaming consoles (Play Station, Xbox).